I dabbed heaping spoonfuls of gingery shrimp mixture in the center of wonton wrappers and clumsily attempted to fold them into little dumplings. Not a single one met my expectations. Eric watched as I struggled and provided silent emotional support. Often, he stays out of my way when I'm cooking, afraid that I might jump down his throat if he makes the smallest comment. I definitely get territorial and oddly sensitive when I'm in the kitchen. It's my personal space and I'm usually not in the mood to have someone around to tell me I'm doing something wrong (which I almost always am). It'd been my plan to make shu mai for quite some time. Growing up, I was a voracious eater, never turning down food, even if it was something a bit out of the ordinary. But my connection to cooking stems from a single moment from my childhood. It was over summer break and my sister was away at camp, leaving me with my parents for a full month. They filled each day with trips to the pool, art projects, and film festivals (one year we watched all of the James Bond films). One afternoon, they suggested that we make a recipe from a Chinese cookbook tucked on the shelf. We all agreed on shrimp shu mai and went to the store for the ingredients. Back at home, I peeled (heads and all) and deveined each one, a process that for a 9 year old took a lot longer than it should have. We chopped the scallion, herbs, garlic, and ginger by hand. A wok was placed on the stove, a bit of water added to the bottom, and was then covered with a bamboo steamer. A feast followed, the result of all the hard work. It's been almost 20 years since I last made shu mai, and I thought it was about time to try it again. The process was almost exactly how I had remembered. Except this time, I was joined by my husband. 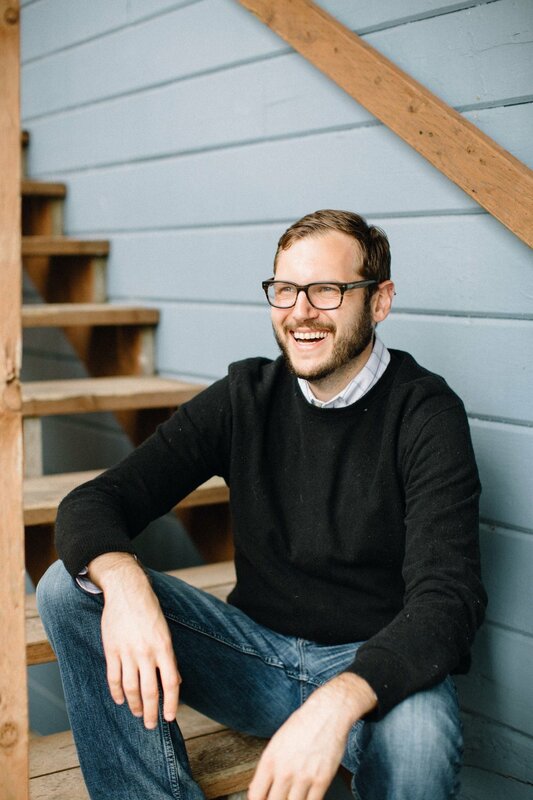 I didn't want to push him aside, I wanted this to be something we experienced together. We stood there and made a few. I looked up at him and realized, at that moment, a new memory had been created. 1. 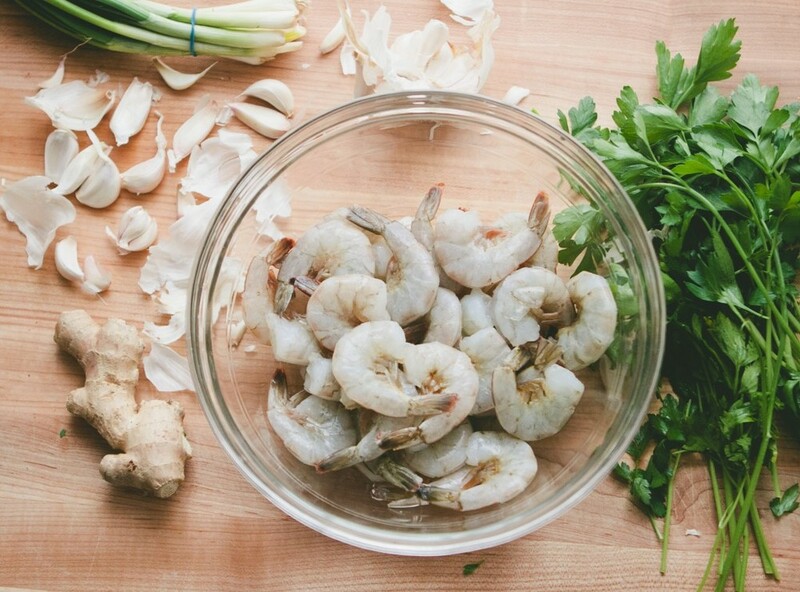 Place half the shrimp in the food processor and pulse until it becomes a thick paste. 2. 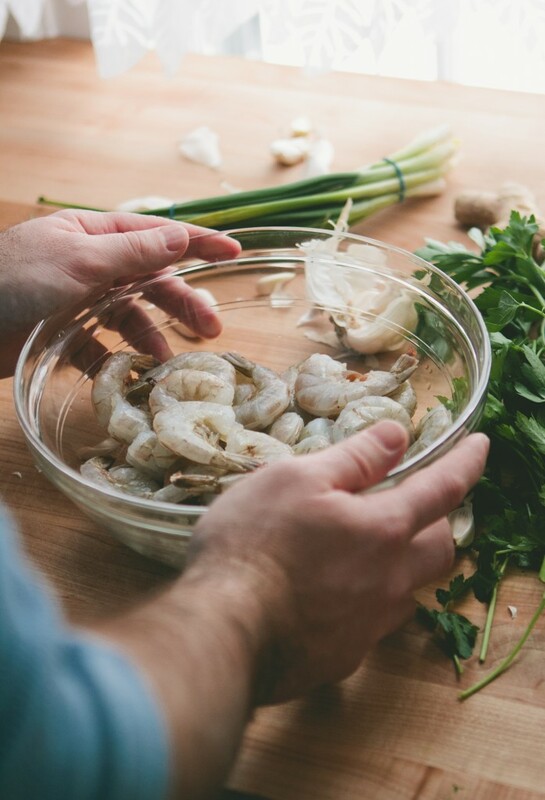 Add the remaining shrimp in the food processor, along with the garlic, ginger, scallions, and cilantro, and pulse five times to chop the shrimp, but make sure the remaining shrimp does not turn into a paste. 3. Place the wonton wrapper on a work surface. Using your finger, slightly moisten the edges of the wrapper with water. Spoon a heaping teaspoon into the center of the wrapper. Squeeze the edges of the wrapper up and around the shrimp mixture, making sure to leave some of the mixture exposed on top. 4. Set a steamer basket in a large pot (one that contains a top) over an inch of water. Bring the water to a boil and then reduce heat to a simmer. 5. 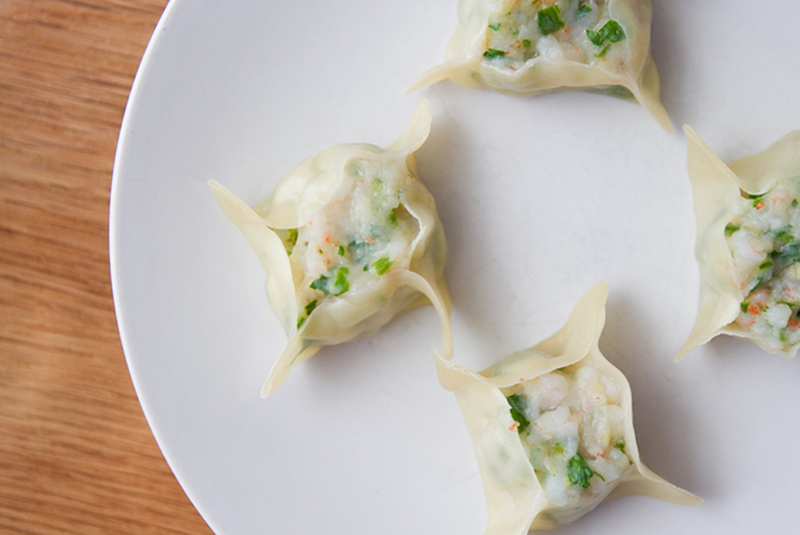 Gently place the shu mai in the steamer in a single layer. Cover the pot and cook for 5-7 minutes, or until the mixture turns pinkish. 6. Meanwhile, mix together the soy sauce and rice vinegar in a mixing bowl. Red chili peppers can be added as well if desired. 7. 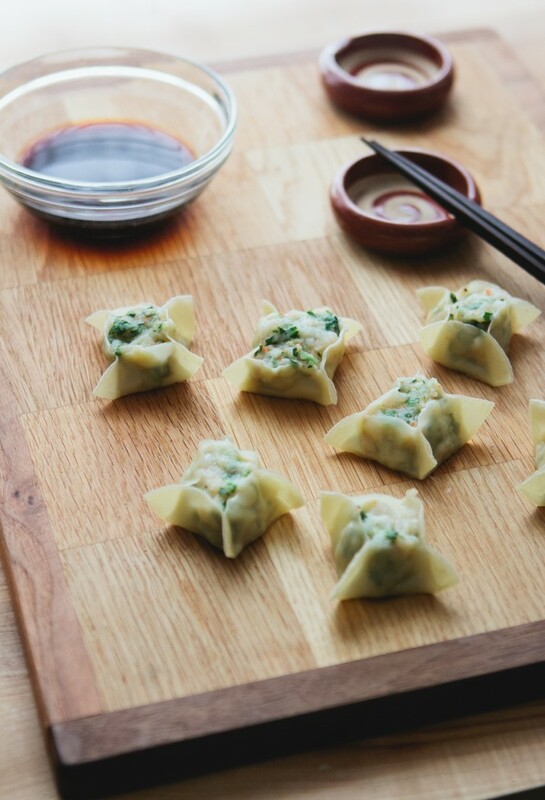 Transfer shu mai to a serving platter and eat immediately (they're never as good when they get cool). Serve with the dipping sauce. 8. Cook the remaining dumplings and enjoy!